Deteriorating U.S. infrastructure assets, a strong labor market, increased construction activity and the demographic need for owner succession have driven demand for EPCM firms resulting in strong business and acquisition activity in the past several years. In a study published in early 2017 by the American Society of Civil Engineers (ASCE) U.S. public infrastructure received an overall score of D+, or “poor, at risk” as assets reach the end of their useful life. To raise the overall infrastructure grade and close the infrastructure gap, it is estimated that Congress and the states must invest an additional $206 billion each year. These projects represent numerous opportunities for EPCM firms. We at Bow River believe this market has strong avenues for growth, considering the increased infrastructure spend expected in the coming years coupled with the continued recovery and stabilization of the energy markets. The EPCM sector has been in the consolidation phase for a few years. Growth through acquisitions and geographical expansion is the most efficient path to enter new regional and vertical markets and diversify service offerings. The public markets provide indications this consolidation trend will likely continue. 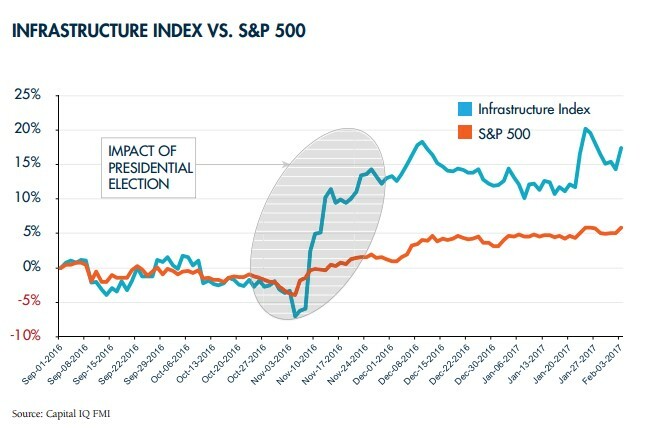 Since the election, U.S. infrastructure-related publicly listed stocks rose significantly. The administration’s stated commitment to infrastructure upgrades combined with decreased regulation makes this sector ripe for opportunity. Participants in the market will enhance service offerings, and likely will turn to acquisition-led growth. We at Bow River believe there are considerable prospects in this market positioned to grow in coming years. As a strong proponent of service-based companies, we see growth opportunities for companies participating in infrastructure development. If you have a current client or business owner that may present a compelling investment opportunity for Bow River in this space, please reach out to us. We would be eager to discuss our thoughts further. Thank you for your continued partnership. Enjoy your spring!